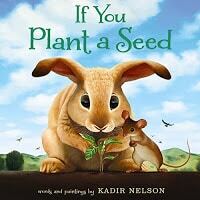 I found If You Plant a Seed (affiliate) when I was browsing through a list of notable new-ish children’s books. Kadir Nelson is an award-winning author-illustrator best known for his stories of diversity and his richly detailed illustrations. 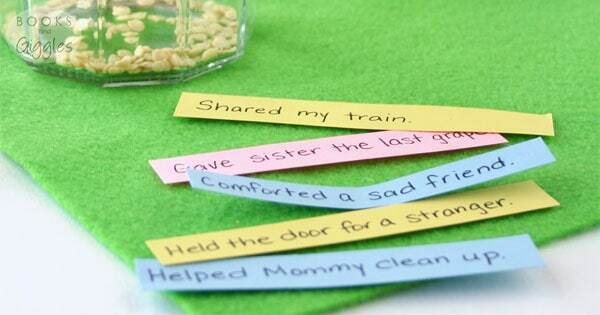 This story of generosity and kindness is appropriate for toddlers and preschoolers. It’s about a bunny and a mouse who plant seeds to grow food. Birds come and try to take their harvest. In the end, though, the animals share their food and together have an even more successful garden. 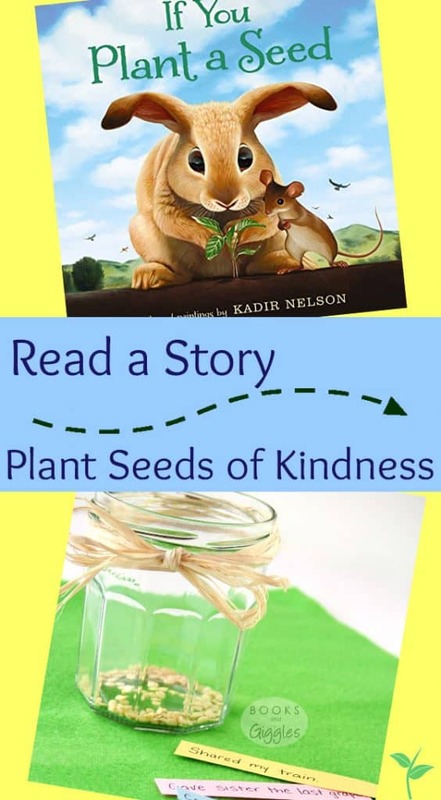 The idea for this kindness activity is simple. Put some seeds you want to plant in the bottom of a jar. Then, catch your children being kind. Write down what they did on a slip of paper, and put it in the jar. When it’s time to plant the seeds, re-read the story, and talk about what’s on the slips of paper. Read the story and explain the activity to your child. 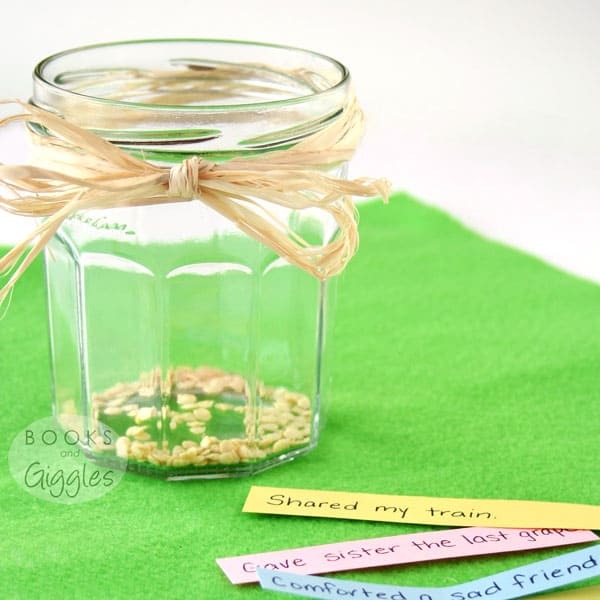 Choose some seeds and put them in a small jar. You may like to decorate it. Store the jar in a dark place such as a cupboard. You might like to read this excellent short article on teaching kindness to children. When you catch your child showing kindness, write down the behavior. Give your child the slip of paper and help him or her put it into the jar. (By “help” I mean make sure they don’t spill the seeds or drop the jar). You don’t have to fill the jar up. You could cram a whole lot of paper in a jar. The idea is to just praise and reinforce good behavior. 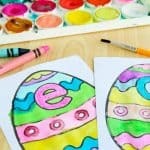 This post is part of the Book Inspired Crafts and Activities for Kids blog hop hosted by Raising Little Superheroes. For more fun and inspiring activities from over 25 other bloggers, you may like to have a look! Love this idea! I'm always looking for ways to reinforce positive behavior. My children will love planting the seeds too. Thanks you for participating in the Book Inspired Blog Hop. This book seems like the perfect one for helping my girls remember to focus on kindness. What an interesting idea with the seeds too! I'm glad you like it.I want to focus on kindness with my kids too. 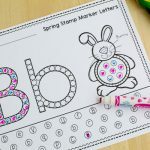 They love planting things and watching them grow, so this activity capitalizes on that. 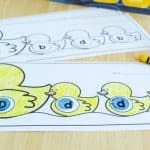 What a lovely activity to go with the book! 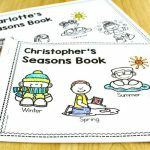 My kids love planting seeds in the vegetable garden each year. I think I will put a few of our seeds aside for this activity.